Manchester City midfielder Yaya Toure will not have a problem returning to CSKA Moscow later this season, according to manager Manuel Pellegrini. Toure faced racist taunts when the clubs met in the Champions League a year ago and the two sides will cross swords again this season. But Pellegrini said: "He does not have a problem to go to Moscow." Toure has suggested black players could boycott the 2018 World Cup if Russia does not tackle the issue of racism. CSKA were punished with a partial stadium closure by European governing body UEFA in the wake of last season's incident and sanctions were increased to full closure after a further offence in another match. That means CSKA will be playing behind closed doors at the Khimki Arena in their first home match of this year's competition. 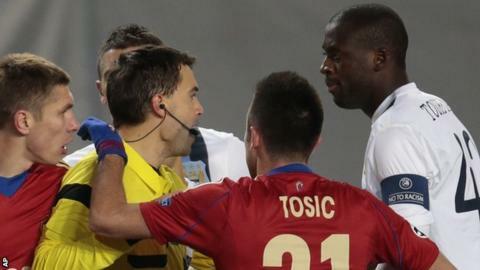 That punishment will have been served by the time City visit Moscow for their third Group E game on October 21, but Pellegrini expects Toure to be prepared to play. Pellegrini said: "At that moment he said what he thinks about it and everyone of us supports him because I don't think those things can happen on a football pitch. "This year Yaya doesn't have a problem."